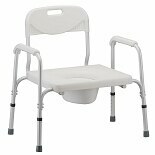 Shop TFI Medical Bariatric Heavy Duty Commode with Elongated Seat (1 ea. )1 ea. 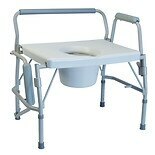 Shop TFI Medical Commode with Elongated Seat, US Made (1 ea. )1 ea. 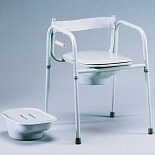 Our selection of bariatric commodes are built of durable frames to handle every day use. 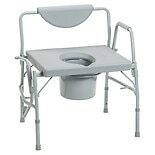 These heavy duty commodes can support up to 1000 pounds and feature drop arms and large seats to make going to the restroom easier. 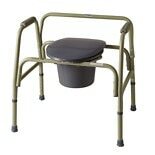 Some extra-large commodes even come with padded seats to improve comfort. Brands such as TFI Medical, Drive Medical and Nova offer bariatric commodes in various sizes, colors and types. Select your bariatric commade based on your preferences and needs. As you shop, choose a commode that can adjust to your height requirements. You can always select your features based on convenience or preference. Different seat types include elongated seats and full-width seats. 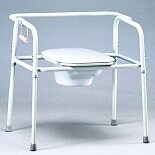 There is even a type of bariatric commode with a built-in toilet paper holder. Walgreens.com carries additional options that can make caring for yourself or a loved one easier. Browse bathroom safety products such as transfer benches for help getting in and out of the shower or tub. 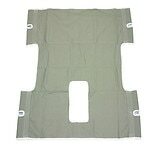 Bath safety mats can give you extra stability, as can grab bars. Hand held shower heads can make washing yourself or a patient easier. If showering isn't always an option, you can use no rinse soap and no rinse shampoo.